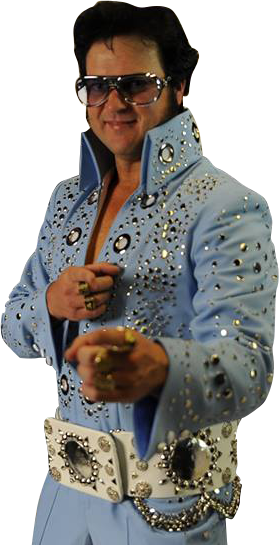 First and foremost Andrew Leonard is a huge Elvis and Cash fan and has been performing as Elvis for almost 14 years and Johnny Cash for 12. He also performs as Dean Martin and Roy Orbison occasionally. It all began back in 2004 after he won a local karaoke competition with his Elvis style rendition of “My Way”. Then the big twist of fate. A week later he overheard a call on 2CA Canberra radio asking for someone to volunteer to as Elvis impersonator for a Fireman’s ball. Impulsively he made the call, got the gig and made his Elvis debut in front of over 500 people at Canberra’s iconic Albert Hall. The crowd went nuts wanting more and Lemvis was born. His Mother made him up a jumpsuit and the rest is history. Since then Lemvis has performed 1000s of shows of all different kinds from birthdays, engagements, weddings, corporate, hen’s nights, pubs, clubs and many more types of events. Some of his more notable clients and shows have been for the Singapore Grand Prix, Revlon Asia Pacific, Rio Tinto, ACTEWAGL, the National Museum of Australia, the National Film and Sound Archives and Floriade. He is quite often featured in newspapers and does voice overs, intro’s and interviews for radio stations. Andrew takes each show as it comes and no matter how big or small it really does not matter. He says “it’s all about giving your best, entertaining and interacting with the people, putting a smile on a face, making someone feel special, touching hearts, creating new Elvis fans but most importantly paying tribute to the greatest entertainer the world has seen and will. No one will ever come close to Elvis…..ever. You would be surprised to know how popular Elvis is with any age group, kids love it. I’ve been hired for 18ths, 21sts to 80ths. I have even done a 1st birthday party. I don’t think the little girl knew much about the King and was a bit shy at first but I had her up dancing in her white tutu in no time. So cute. The King will never die”. Lemvis has come a long way since 2004 and is now entertaining fulltime. His Mums jumpsuits have been replaced with replica’s made in the USA, his voice has matured and the passion is there more than ever.